If you have squirrels in the attic, the first thing to do to get rid of them is to get them out. 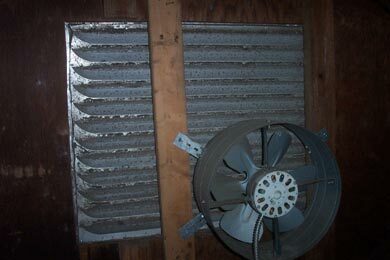 Squirrels go in and out of attics several times a day. They are not living up there 24/7. They of course have to go outside to eat and drink. They must be physically excluded from the attic, and preferably trapped and removed. There is no effective product that you can just buy and apply to make them leave the attic. Examples of bogus products include mothballs, ammonia, hot pepper sauce, ultrasonic sound emitters, and fox or coyote urine. Sorry, these tactics don't work in the slightest. 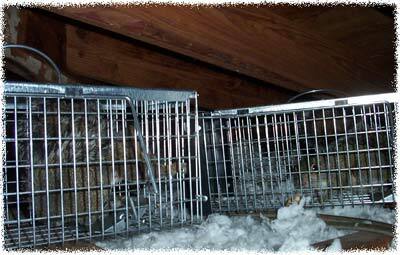 1) Trap and Remove - the best way to get rid of the squirrels in your attic. Of course, once trapped, they must be relocated far away, and most importantly, the entry points must be permanently sealed. 2) One-Way Door - effective if properly installed and if there are no other ways for the squirrels to get back in. The squirrel exits the attic as usual to go outside for food and water, but it simply can't get back in. 4) The most important thing is to eliminate the entry points into the attic. See the below examples. 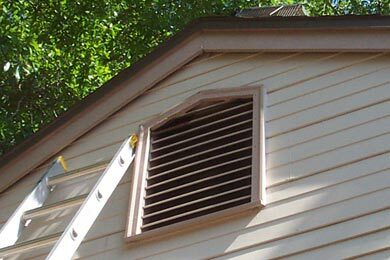 1) This is a typical gable vent. You might notice the chewing in the upper-left corner. I watched squirrels go in and out of this spot. 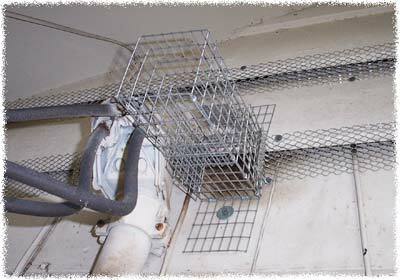 2) After I trapped and removed all of the squirrels, I sealed up the vent with the heavy steel mesh. 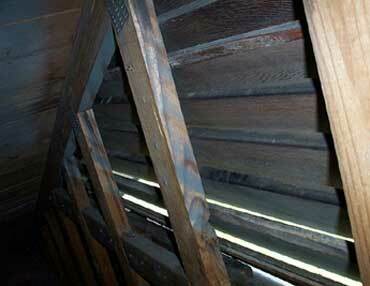 1) This is another gable vent, as seen from inside the attic. 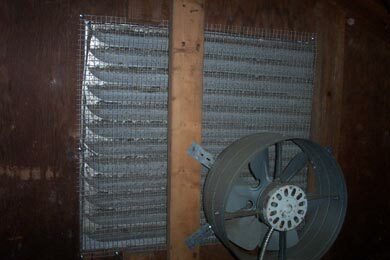 2) The fan made it a bit more difficult, but I still installed a steel screen to keep out squirrels and rats. 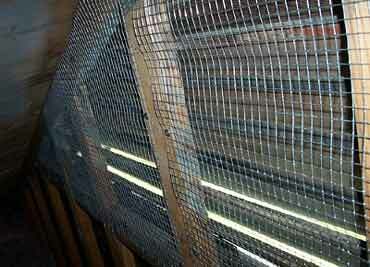 1) Yet another giant gable vent, with old & deteriorated screening. Squirrels were going in and out of this opening. 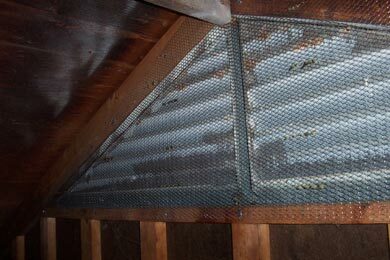 2) The steel screen must cover the entire space in order to keep squirrels out of the attic. Or better yet, for my most detailed explanation of how to get squirrels out of your attic, click the link. When you hear the pitter-patter of tiny feet in your attic, a problem has arisen. 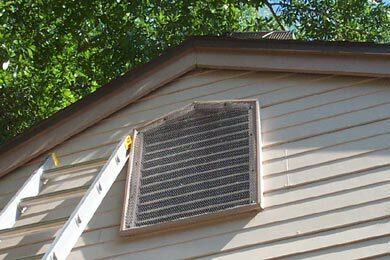 It could be a rat, squirrels, or many other rodents that have an annoying habit of making their way into your home and making a little tiny home for themselves. One thing is for sure – you will need to get rid of them, and if you don’t do so properly and educate yourself first, you could have a much wider spread problem on your hands. 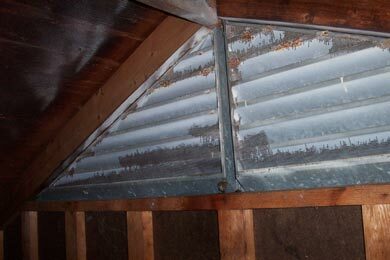 The squirrels in your attic may be annoying to the ear, with their teeny-tiny little feet pattering around above your head when you are trying to sleep at night, but they will also bring with them a handful of other problems, which in turn, could create a very expensive and disappointing problem as well. Those family heirlooms that you have nicely tucked away in your attic could be nibbled by your rodent problem, as well as your rafters, any electrical wiring and even the floor and insulation. This is why it is vitally important to get rid of them properly. So, what’s the right way to get rid of the squirrels that have made their home in your attic? One of the best ways, and perhaps one of the easiest, is with traps, but this will come with its fair share of problems at the same time. You need to get the right trap, learn how far away from your house to release the animal so that it doesn’t come back, and even concern yourself with a family problem – what happens if your squirrel has had a teeny-tiny little family? You may have gotten rid of the mother, but what about the babies? If you take away their source of food, (the mother) you will have tiny little squirrels dying from starvation, which will not only be incredibly inhumane and painful for the little animals, but will also attract many other rodents and bigger problems if they smell the decomposing animals. There are other ways that you can try to get rid of squirrels from your attic – you could try using a strobe light. This powerful pulsing light will hurt the poor, sensitive eyes of the squirrel and could drive them away in a more natural manner, especially if you buy a good strobe light and have patience in your quest. Once you have trapped your animal and removed it, or driven it away with the help of a strobe light, it’s time to take a look at how they got into your home in the first place. If you leave the holes open, you could end up basically inviting the squirrels to come back or worse, invite rats and other rodents and animals in your home. The easiest way to get rid of squirrels from your attic is to hire a professional. They will not only be educated in how to effectively get rid of any pests that you have in your home, but will also be able to help you out at the same time – giving you information on how to avoid further pests, how to block up the holes that they use to get in and out of your home, (some may even do this part for you) and on top of that, will give you the peace of mind that your animal has been removed humanely and released back into its natural habitat.